Duke's Preliminary Top 5's of Overwatch! So Overwatch had been out for a few days now. After playing for a while I feel like I have a good understanding of the flow and pros and cons of most of the cast. So here’s a few top 5 lists that’s not just top 5 characters period. 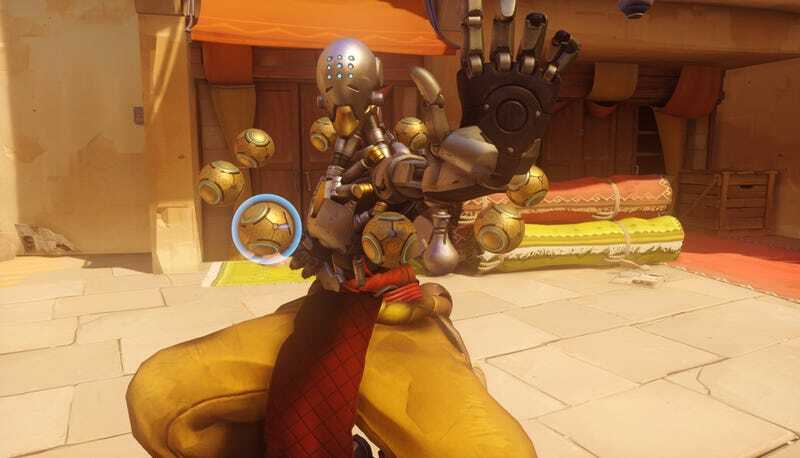 Alright let me start off by saying that Zenyatta is my favourite character in the entire game. I like his design, his skills are fantastic, he has the longest range heal in the game. (if your ally is in sight, harmony orb will attach). I like his package, and I’m mostly going to be playing support/defense characters as I like their gameplay style. I may have a thing for characters that use bows. Hanzo is my preferred sniper and his skill package is okay. His sonic arrow is amazing and should always be used off cooldown. His scatter arrow on the other hand only has a handfull of uses. His ultimate will annihilate the other team if unaware or caught in the multiple CC ults. The engineer of the game, Torbjorn can bunker up and put his turrets to good use. His armor packs can also help a lot, especially on your support players. His weapon, has really good range, and can hit for a lot. I’ve always wanted to create laser death rooms. With Symmetra, now I can! Symmetra is one of the better supports on defense in my opinion. She doesn’t have a direct heal, but compensates by being a more utility based character in the sense of shields, teleports and of course her many, many laser sentries. The definition of the word “tank”. Reinhardt is the tank to any offense or defense strategy. His barrier is always useful and while his swipe has minimal uses, can be great for nailing a flying Pharah or getting last hit on a retreating foe. His ultimate can also lead to a pretty bad time for the opposing team if you happen to hit them all. Information is the greatest weapon there is. Sonic Arrow is great, as it shows where the enemy is coming from. When placed properly. An attack can be stymied before it even begins. It’s also great for planning an attack by seeing where the enemy is placed on defense. It might not be a good as Widowmaker’s ultimate, but it isn’t reliant on having your ultimate meter filled. If Information is the greatest weapon, then space control is one of the greater defensive options. This is why Mei’s Ice Wall is so good. By cutting off a point of access for a limited time, you’re forcing the enemy into a bottleneck. Which then can be taken advantage of. One of the better attack initiating skills in the game. Charge can take an enemy out before they know what hits them. Better used to seperate healers from their team. Charge is great on offense and defense. Let’s face it, we’ve all been hooked at one time or another. The hook is a great tool for seperating teams and killing problem characters before going in for a siege. With only a 6 second CD, hook will always be ready to reel the next enemy in. Deflect might be the best counter skill in the entire game. At the right time, deflect will turn the tide of a battle very quickly. Plus the ability to deflect different ultimates back at the opposing team, is just too good to pass up. Reaper’s Shadow Step into Death Blossom can take out an entire control point defense. Hard to counter unless the the ultimate is used improperly. Death Blossom is the definitive death dealer. Another ultimate that can be hard to deal with if caught by surprise. Barrage has a wide area of effect and is very effective in bottleneck situations. The audio tip-off however can backfire. The absolute main reason you target the healer first. Transcendence will turn a massacre on one side into a massacre on the other. The best siege ultimate of the supportive cast. The invulnerability just puts the ultimate over the edge. Nothing says hello like a pair of spirit dragons coming out of a fortified wall. Dragonstrike is best used behind cover and from a far enough distance away that the audio cue is mostly silent. One of the better bottleneck killers in the game. Dragonstrike is best used in combination with sonic arrow for best effect. Let the salt flow! Self-destruct is best tank ult for securing a point in the game. While it may not kill some enemies, it will cause them to scatter. This gives enough time to get in and at least put a foothold on the control point. This, combined with Boosters turns your Meka, into a cruise missile. Can’t say no to negating the respawn timer. Resurrect will keep the defense going for long time. Blizzard will stop a siege in its tracks, literally. With a control point range combined with a slow and stun combined. Blizzard will ensure a successful defense. Respawn timer got you down? Long trek back to the action? Well have no fears because Symmetra’s Teleporter will get you there fast. The best utility in the entire game, will make your defensive line never end. While not as effective as Mei’s Blizzard, Graviton Surge gets the job done. By sucking foes in you can set up some targets for McCree’s High Noon, Pharah’s Barrage or Genji’s Dragonblade. and give you time to heal your team. 1. Look at how cute she is! 2. SERIOUSLY! She’s that cute! 3. She basically has Eva as a companion for god sake! 5. Any of her voice lines. Those were my varied top 5's. I’d like to hear your thoughts in the comments below. Share with me your top 5 lists, I want to compare lists. Until next time, play more Overwatch! AlmightyDuke is an average gamer from the Great White North. When he’s not slinging cards in Hearthstone,or supporting the Overwatch, he’s sharing the good vibes and good laughs. Follow him here, @AlmightyDuke_NL .